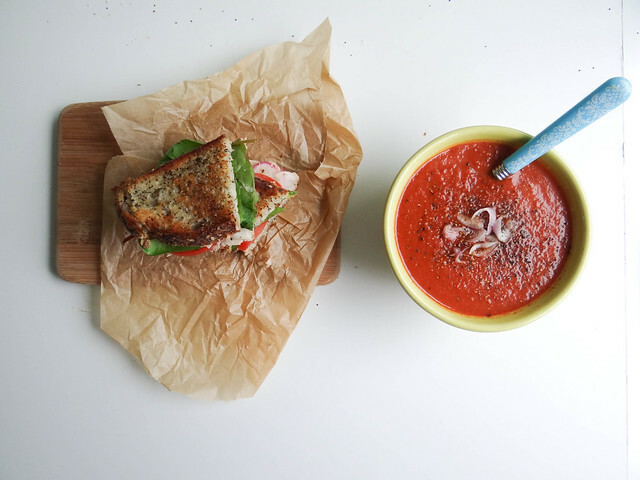 Growing up my Mom made tomato soup from a can- Campbells to be exact, always served with grilled cheese and saltine crackers. 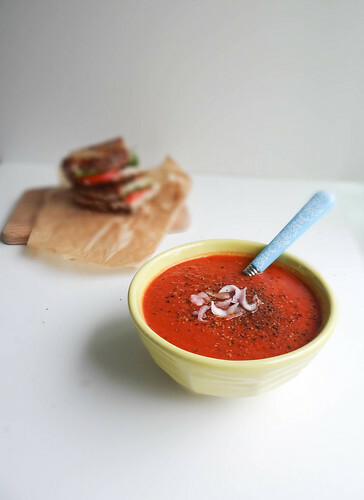 I like to think of this soup as the grown up version, a little more in depth flavor, less preservative - tomato soup should be just that, tomato soup! 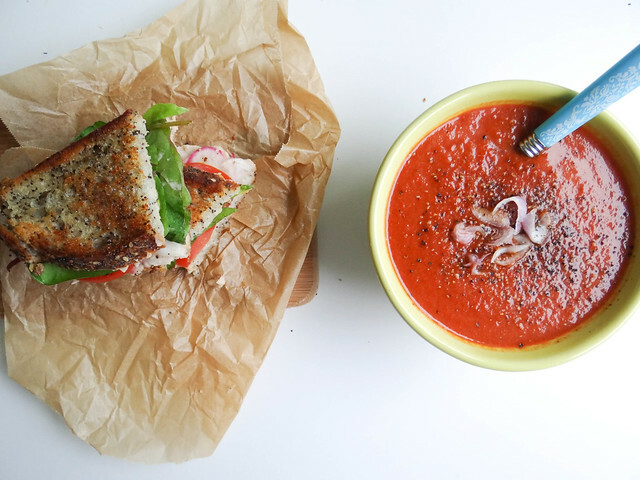 With a little extra zing that is, it is a trillion times better than any tomato soup in a can. In my pantry you will always find either canned tomatoes from the previous summer or when those run out a box of POMI chopped tomatoes or San Marzano tomatoes can be found in its place. Fresh, canned or boxed whatever you have on hand will work in this recipe. If using fresh you will need to adjust the cooking time- increase by about 30 minutes or until thickened. Shallots and balsamic with a bit of pure honey to cut the acid turns this childhood comfort into a grown up - finished with plenty of fresh cracked pepper and a sprinkling of good salt, you really can't go wrong. In a medium soup pot/sauce pan over medium heat drizzle olive oil into the pan. Add shallot & garlic, saute until aromatic & slightly translucent. Add tomatoes and bring to a simmer, add in balsamic & honey/agave. Cover and simmer for 10 minutes. Temper the milk by transferring a small amount of hot soup to a bowl, slowly add the milk to the small bowl of hot soup. Add the tempered milk/soup mix to the larger pot and stir. Season with salt & pepper. Love how simple and lovely this is! Yum! I, too, crave soup as comfort food, even at the height of summer. Soup + binge watching Netflix + snuggling with my dog = the cure for all my ills. This soup looks delicious. 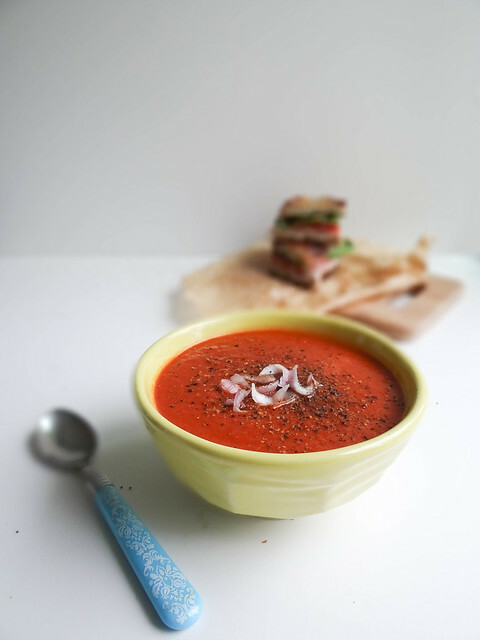 I love tomatoes with balsamic, so I can imagine the combination gives this soup an amazing flavour! It also sounds like the type of soup that would taste good chilled if it's a really hot day. 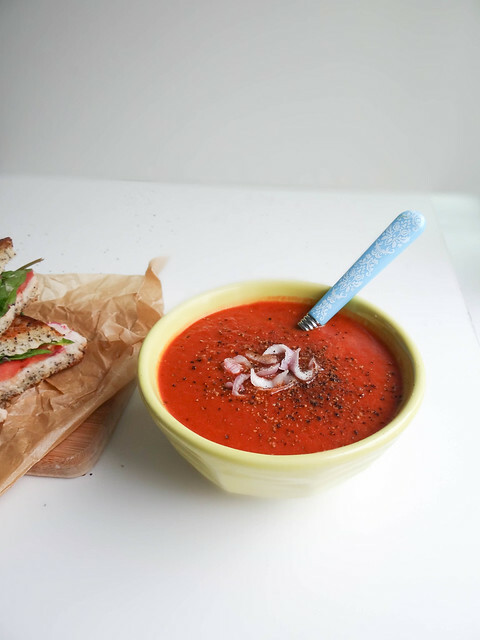 that soup looks so perfect!! So smart, with the balsamic! 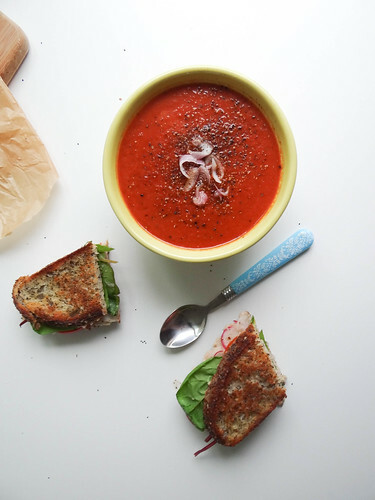 I'm having a hard time setting aside any of the fresh tomatoes that are slowly coming in around here, but this recipe is definitely going into my file for a rainy day!